Baylor Athletics in conjunction with NIKE, unveiled a refined visual identity for the department at McLane Stadium Saturday, April 13, ahead of the annual Green and Gold football game. Baylor University President Linda A. Livingstone, Ph.D., Vice President and Director of Intercollegiate Athletics Mack B. Rhoades, IV, along with representatives from the NIKE Global Identity Group (GIG) were on hand to introduce a unified color palette, updated primary and secondary marks, new wordmarks and a custom brand font and numeral system. Until now, Baylor sports teams could be seen competing in a variety of five different greens and three different golds. Also, more than 20 different variations of the interlocking BU and Baylor wordmark were utilized on both uniforms and campus facilities. On Saturday, a ribbon-cutting ceremony with Baylor dignitaries, student-athletes community leaders, and fans celebrated the unveiling of the new visual system – and gave fans access to a limited-time experience with jerseys on display for six of Baylor’s sports programs, including football, men’s and women’s basketball, baseball, softball and volleyball. All teams’ apparel will reflect the new brand colors and elements in the upcoming 2019-20 season. 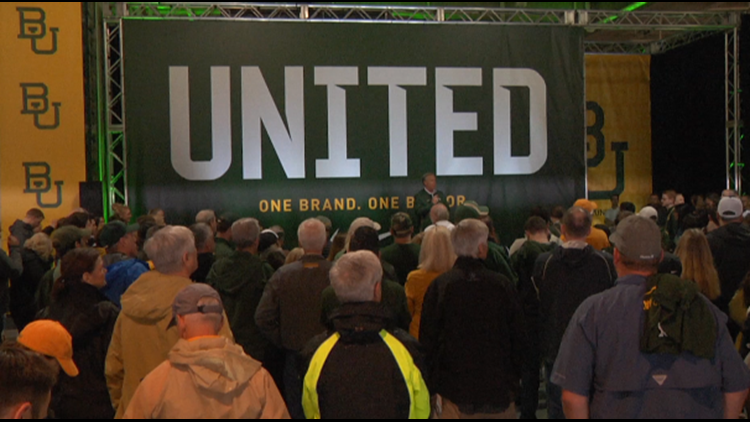 The iconic interlocking BU will continue to serve as Baylor athletics’ primary mark. With a focus on legacy and tradition, this mark has evolved in a way that respects the integrity of the past, while representing our continual push toward the future. In keeping with the core architecture of the former interlocking BU, the updated mark boosts rounded edges, angled interior corners, and a sharp interior chisel fashioned to replicate the tip of a bear claw. A secondary mark revealed an updated bear head that complements the lines and boldness of the primary mark. Perhaps most notably, a singular green and gold have been identified as the two main brand colors. A deep “Gorge Green” and a bold “University Gold” were selected as a nod to the university’s classic color pairing and will serve to bring all athletics programs together under a cohesive color palette.